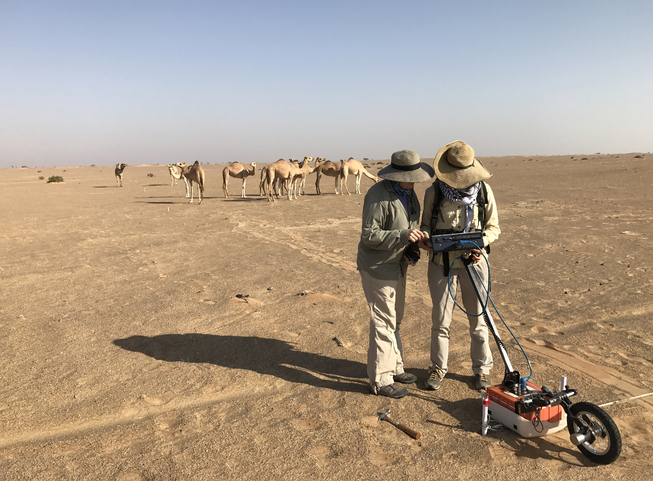 Researchers Katie Simon and Jennie Sturm use the SIR 3000 with 400 MHz antennas to map an iron metalworking site in western Oman. The National Science Foundation has renewed funding for the Spatial Archaeometry Research Collaborations program, an initiative through the University of Arkansas, Dartmouth College and the University of Glasgow that acts as a national hub for geospatial research in archaeology. The $158,762 grant allows the SPARC program to continue to provide research and technical expertise to archaeological research projects working with a variety of technologies, including 3-D survey and modeling, geospatial analysis and visualization, and geophysical and airborne remote-sensing. In 2017-2018 the SPARC team plans to focus on analytical and publication projects. The SPARC program was created by the Center for Advanced Spatial Technologies and the Archaeo-Imaging Laboratory with a $250,000 grant from the NSF in 2013. The program offers direct support to archaeological projects through awards in fieldwork, data and analytics, and publication. In addition to collaborating on research projects directly, SPARC helps researchers learn about the latest technologies and their archaeological applications through residencies at the Center for Advanced Spatial Technologies or through online resources and periodic webinars. For many decades, space has been viewed as one of the central dimensions of archaeological study, from artifacts to landscapes, and SPARC supports a wide variety of collaborators and projects around the world. Researchers at the Center for Advanced Spatial Technologies have collaborated on 29 projects worldwide, including working with the Cameron Monroe, University of California-Santa Cruz, to document and study the standing architecture and sub-surface archaeology at San Souci in Haiti; with Nick Carter and colleagues at Harvard University to analyze relationships between terrain, routeways, and evolving settlement patterns in the Five Lands region during the Classic period of Maya culture history; and with Krysta Ryzewski, Wayne State University, and John Cherry, Brown University, to use airborne lidar to map potential cultural landscape features and other anomalies in the Centre Hills region of Montserrat. About the Center for Advanced Spatial Technologies: The Center for Advanced Spatial Technologies is a multidisciplinary center for spatial research and technology housed within the J. William Fulbright College of Arts and Sciences at the University of Arkansas. Established in 1991, CAST offers students, faculty, and the public opportunities to learn about the various applications of geographic information systems. CAST investigators span the social and physical sciences with expertise in the measurement and analysis of spatially referenced, multi-scalar data and processes, and are funded primarily through external sponsorships. More information about CAST can be found at cast.uark.edu. For ongoing news, follow CAST on Facebook and Twitter.